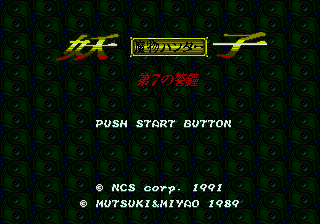 Mamono Hunter Youko: Dai 7 no Keishou (魔物ハンター妖子 第７の警鐘) is a 1991 Sega Mega Drive action game by NCS made to tie into the Mamono Hunter Youko direct-to-video anime series. and jump. swings your sword. Hold to gradually generate a circular shield. Keep holding to keep the shield. If you let go of , press it again quickly to send the shield out to attack enemies, but hold it again if you want to keep the shield when it comes back. To get rid of the shield, simply do not press again. Main article: Mamono Hunter Youko: Dai 7 no Keishou/Magazine articles.